I have used both a courier service and Delta PetSafe for shipping. The options all depend on where you live and what is available in your area. Delta does provide a nice temperature controlled environment with year around service to most locations. Shipping price $350 for most locations within the US. With shipping/pet carrier and health certification. $60 fee for transport to DFW and $120 fee for transport to Lovefield. All kittens are $1250 with $200 discount on the 2nd kitten. Price increase in keeping with the increase nationwide. I am still half the price of most breeders. Remember the cost must include housing all breeders male and female year around,(this includes lots of square footage as they are free to run and play without cages), as well as heating and a/c, vet bills, food, cleaning and remodeling ongoing. My costs are higher as I only breed for 1 litter yearly..for the health of the mom. I also feed organic High quality human grade foods. Deposit to hold your baby is $300. Deposits are nonrefundable but transferable to another kitten. Please contact me to check availability and place kitten on hold. If using Paypal the icon can be found on the purchase tab…please remember to include the 3.5% fee. If for any reason you are not able to get your kitten please notify me asap..That will allow me time to find a new home for your baby. I appreciate those of you who can make payments along the way or pay for the kitten by 8 weeks…this helps me with the food and vet bills along the way. If payment is not complete until pickup, please bring cash or money order….no personal checks on pickup. I frequently meet those of you coming from Austin and San Antonio in Waco. I am glad to do this for you and decrease your trip by 3 hours. Those coming from Houston I frequently meet in Ennis. That is a $60 fee to both locations. I do charge a .50 cent per mile charge for meeting you with your kitten. This covers my time and gas and wear on my vehicle. Thank you for remembering to include it in your payment. I do reserve the right to refuse sale of my kittens to those who clearly do not have the kittens best interest in mind. All kittens will be replaced if ever there were a genetic problem. All I will need is a letter from the Vet and autopsy report.. No questions asked. All breeding parents are HCM neg/neg FIP and Fe leukemia negative. 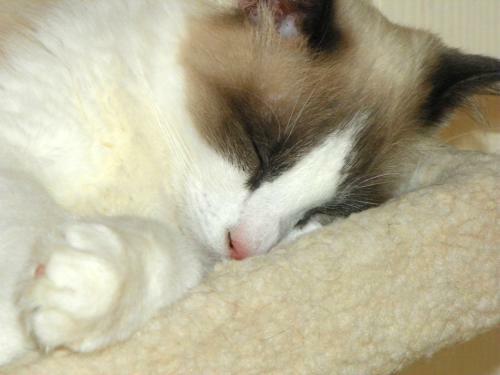 TICA Registered Ragdolls carefully selected for color/health/temperment/loads of personality and tender loving care! I do not require an intrusive application, however. out of kindness I would appreciate knowing how our little babies will be taken care of. That you have read and agree to consider my suggestions. And for the happiness of the kitten please have a playmate. I will give a significant discount if you buy 2. Ragdoll kittens and cats do not do well alone without another Ragdoll. They are very close knit and family oriented. Don’t worry, they can love you and each other. In fact they will love you more for meeting their social needs. Although I prefer to send my kittens home with a playmate I do make exceptions for those of you who already have pets. Even the Ragdoll Rescue requires 2 kittens go home together. I believe it is cruel to breed these kittens to be emotionally dependent on each other and not provide their needs. I consider it my job to educate people on this unique breed who loves so unconditionally and brings so much joy and contentment into our homes and lives. I prefer to miss a sale rather than know my babies are grieving, sad and lonely with no ability to tell you until they quit eating and drinking and die. I do give a generous $250 discount on the second kitten. Something I have not seen any other breeder do. I do reserve the right to not sell to anyone who does not seem to have the kittens best interest in mind. All of my kittens come from huge families with lots of love from moms/aunts/brothers and sisters and do not want to be home alone!.. .Ragdolls are loved and sought after for the affection they give. But just like Lovebirds are unique to the bird world….so are these lovely creatures to the cat world. They are not like other feline breeds. They are not independent but codependent on each other and their people. They crave touch/talking/grooming and constant play and affection..Even If you are retired or home all the time, they still need each other to play with and groom and talk to. If you work away from home, drive in traffic, go out for dates, go to school , take trips and in general have a life. PLEASE get 2 kittens. I will help you by giving you a $200 discount on the 2nd kitten. They will be more loving and affectionate if their needs are met as well. They constantly talk to each other and play and groom each other and even use the litter box together. Don’t worry they will still bond to you and adore you for caring enough to meet their needs as well. I highly recommend the “Guide to Owning a Ragdoll Cat”. This book is available at Amazon.com. I found this book very concise and informative even to those of us with biology degrees. Yet simple and an easy read. Please do not smoke in the home of Ragdoll Cat. They are very sensative. Please do not declaw them. This is much like cutting off the end of your own fingers. IF YOU NEED EAR MITE OR FLEA CONTROL IN THE FUTURE PLEASE USE REVOLUTION. RAGDOLL CATS SEEM TO TOLERATE THIS ONE MUCH BETTER THAN OTHER BRANDS. I lost a cat in 2009 to the toxins of flea medication. It is a neuro toxin. Keep your cats inside and with the windows open in the fresh air and sun…they can enjoy the sound and feel of air and insects and birds without exposure to toxic flea medication. Best of all build a nice screened in porch that the cats can access year around to feel the change in season. Provide water purifiers and fresh grown catnip and wheat grass for them to graze. Do build or purchase a cat tree and shelving. They do love to climb and sharpen their claws on sizzle rope. Cashmere my first love and inspiration into the Ragdoll world. Please add the 3.5% Paypal fee if you need to use paypal…otherwise contact me for mailing address to send personal check or money order. For kitten deposits or payments please click the Paypal button below.